There aren’t many gaming notebooks that can beat the G703 for speed or quality, but this laptop is hugely expensive – and just huge, too. The Asus ROG G703 is a large and imposing laptop, but it’s a superb choice if you’re not willing to make any compromises. Positive: Powerful hardware; excellent display; high performance. Negative: Expensive. “Professional gamers, come here! We have something to show you!”. I would not be surprised if Asus were to use a similar language to that sentence when introducing G703 models. Because, this model is in my opinion a true translation of what Republic of Gamers should mean. I am not just talking about hardware or keyboard etc. There are a few things that may separate G703 from the rest. Sure, first hardware: 7820HK processor with GTX 1080 graphics card. 32 GB RAM, 512 GB SSD blazing fast SSD. All this sounds boring to me, since all this be found in competitors as well. To me what differs this model from the rest is hidden inside its specifications sheet. First thing that I liked about this model the Anti Dust cooling system that Asus brags about. If it is to be true and if you are someone like me that can not tolerate to open hardware just to clean dust, it is amazing. Think about it, you do not have to open your laptops internal every 3-6 months just to see dust. On the other hand this assures that your CPU and GPU do not get overheated because of dirt. Your fan noise will never change and so on. The other feature that I liked, as a gamer, is the possibility to use Xbox controllers directly. Asus claims they have included a built in Xbox Wireless controller module, so gamers can directly use their Xbox controllers for playing games. It is nice to have, and useful in real life scenarios. You do not have to use a USB port just for a remote connector. G703 comes with latest technologies; HDMI 2.0, Thunderbolt 3, mDPI 1.4. So in terms of being future proof, you are in good hands. Let us talk about what might change your mind about this device. First of all it is bulky, actually, not bulky it is total bulk. It weighs around 5 kg and has a thickness of close to 4 cm. So its base unit is pretty huge. The buying decision starts with, if you are not going to be mobile with this device, is it worth purchasing it? Device is great, do not get me wrong. Case, workmanship, everything about it is good. But its price tag is high. For such a price tag, you do not even get a 4K screen and stuck to a FHD panel. Since it is heavy and to get full performance you need to keep it plugged in all the time, should you buy a desktop model instead? Well, if you are not going to be joining gaming parties and not planning to move your laptop from your desk anytime soon, you should question this option. Asus G703VI-XH74K has everything a gamer can ask for. All the performance you need, but well in a relatively low resolution. Does the price tag worth the purchase? You need to decide it on your own. The Asus G703VI-XH74K is a new ultra-high-end gaming laptop that combines an overclocked CPU with a 17.3” display featuring a 144 Hz refresh rate. It is meant to deliver gaming desktop-like performance. Its price is higher than advanced desktop PCs due to the display and portability. Many leading gaming laptop vendors have started to offer FHD panels with 120 Hz refresh rate. This time, ASUS and AUO up the ante once again and roll out the industry’s first laptop with a 17.3” AHVA panel featuring a native 144 Hz refresh rate. This is combined with G-Sync, allowing for a variable refresh rate based on game performance. 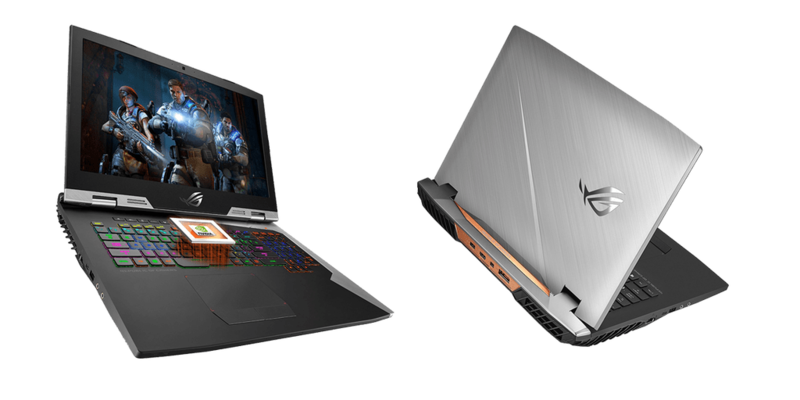 The ROG G703VI-XH74K is the only laptop in the world with such a high refresh rate so far. To further appeal to gamers, the ASUS ROG G703 comes with a keyboard featuring keys with a 2.5 mm travel, N-key rollover, customizable RGB backlighting as well as dedicated buttons to start the XSplit Gamecaster, program AURA lighting, adjust the ROG settings or wirelessly connect to Microsoft’s Xbox One controllers. 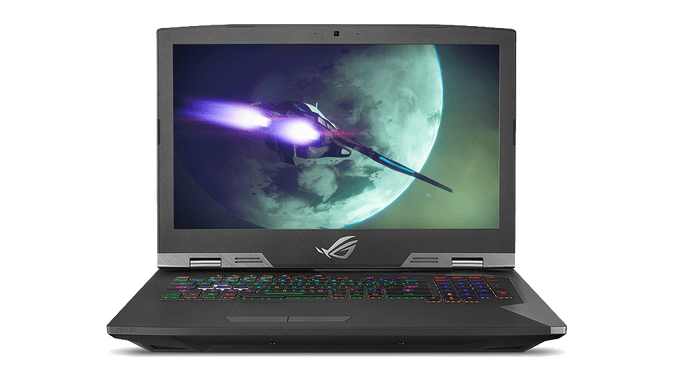 At the heart of the ASUS ROG G703VI Chimera, there is Intel’s Core i7-7820HK processor that is factory overclocked and runs at up to 4.3 GHz in single-core burst mode (400 MHz higher than recommended by Intel), which could be useful for some games. The processor features unlocked multiplier theoretically enabling users to increase frequency for all four cores. Moving on to memory and storage, the ASUS ROG G703VI-XH74K comes with 32 GB of DDR4-2800 (expandable to 64GB), two 256 GB PCIe 3.0 x4 SSDs running in RAID 0 and a 1 TB 2.5” hybrid drive. As for the graphics processor, it is equipped with the Nvidia GeForce GTX 1080 GPU that will be able to operate at up to 1974 MHz in boost mode (up from 1733 MHz recommended by Nvidia) and push its memory to 10.3 GT/s data transfer rate (up from 10 GT/s). The GPU supports NVIDIA’s G-Sync dynamic refresh rate technology, which will be helpful for the 144 Hz display panel. To guarantee proper cooling of the components and ensure stability in the long-term, ASUS has equipped its G703 with its new Anti-Dust Cooling (ADC) system that can clean itself from dust and provide better cooling performance in general. The ADC uses two 12 V blowers (instead of regular 5 V blowers) that can create a very high air pressure when needed to exhaust dust and other particles sucked into the chassis, or just spin faster when extra cooling performance is needed. 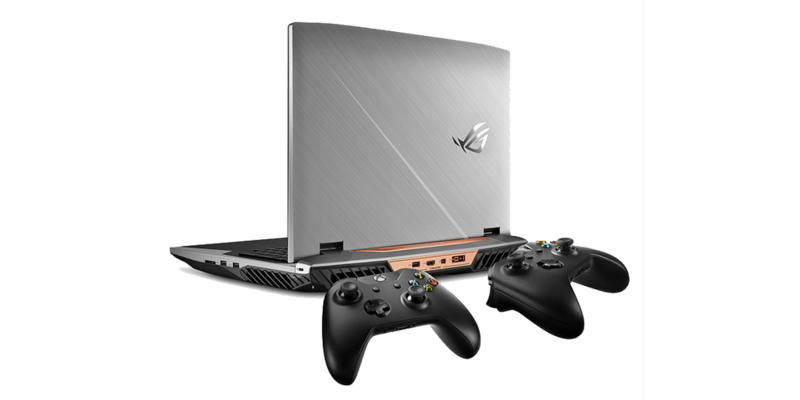 For connectivity, the ROG G703 has a Gigabit Ethernet port, an 802.11ac Wi-Fi module, one Thunderbolt 3 port, four USB 3.0 Type-A connectors, an SD card reader, a mDP 1.4 port, an HDMI output and so on. With three display outputs and the GPU, this means a total of four monitors are supported. 7820HK: Quad-core notebook processor based on the Kaby Lake architecture running at 2.9 - 3.9 GHz. It is the second fastest model of the consumer H-series in the beginning of 2017. The chip also integrates the HD Graphics 630 GPU clocked at 350 - 1100 MHz and is manufactured in a 14 nm process (improved compared to Skylake). Compared to the Core i7-7820HQ, the 7820HK lacks business features like vPro or TXT support.» Further information can be found in our Comparison of Mobile Processsors.